Last Saturday morning was a cold sharp day in New York. 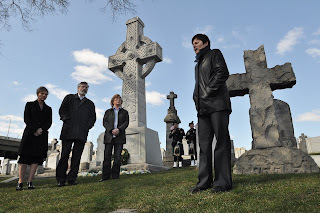 This blog travelled to Calvary Cemetery in Woodside in the Borough of Queens to attend a commemoration in memory of the 1981 hunger strikers. Over the years I have been in many such places. But Calvary is on a different scale to anything this blog has ever experienced before. It is huge. It is so big that it is divided into four parts and together they hold over three million souls. Calvary Cemetery was established in 1847 and opened the following year. It is said that there were 50 burials a day and that half were Irish. 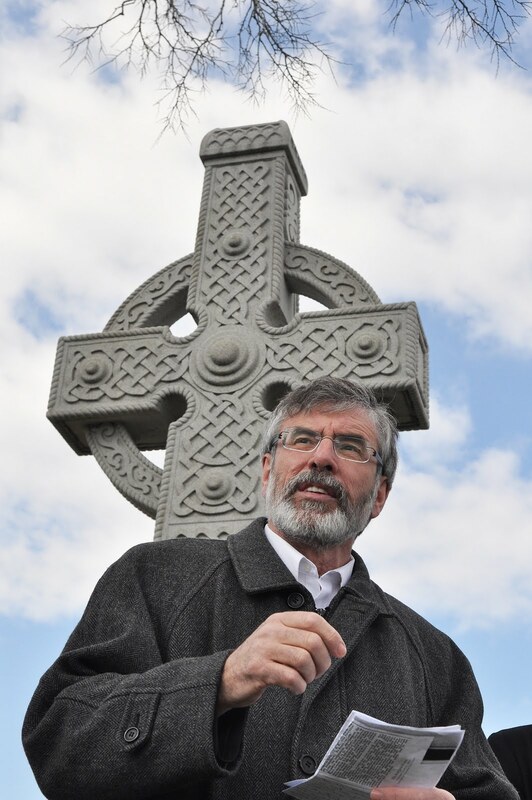 Mostly victims of An Gorta Mór – the great hunger. They were some of the hundreds of thousands of Irish men and women and children, who had fled starvation and poverty in Ireland for the new world, only to catch cholera or some other illness. They died in fever camps and ports the length of Canada and the USA. Saturdays’ commemoration was fittingly at the Patriots Plot. A large Celtic Cross marks the spot where the Irish Republican Brotherhood decided to open a republican plot in 1907. 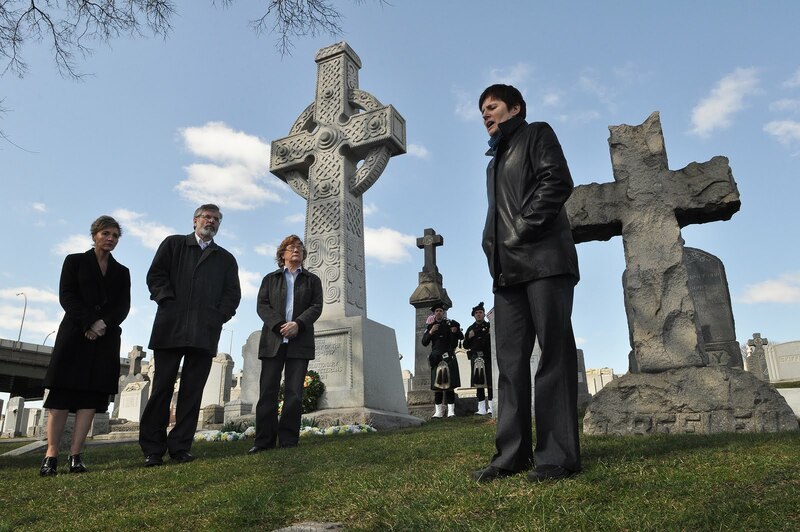 It is dedicated to the memory of those who rose in rebellion against the British during the Fenian campaign in 1867. Although that rising failed the IRB stayed true. For decades it planned and organised. Nine years after the Patriots Plot was opened the IRB was at the heart of the Easter Rising of 1916, the proclamation of The Republic and the formation of the IRA. Larry Downes, who is the President of Friends of Sinn Féin in the USA, gave me an old report from the New York Times of the burial of John Neary. He was the first to be buried the Patriots Plot. But Neary’s connections with republican struggle predate even the Fenian Rising. He was involved also in the abortive rising of the Young Irelanders in 1848 and after that, like many hundreds of thousands of others of his generation after the great hunger, he was forced to leave Ireland. Many went to the USA. Others scattered around the globe and many moved to England. John Neary was one of those. But he was soon a committed and active Fenian. He was one of those involved in 1867 in planning the escape of Thomas Kelly and Timothy Deary, two leading Fenian activists as they were being taken to prison in Manchester. Kelly and Deary escaped but three of those involved in helping them - William Philip Allen, Michael Larkin, and Michael O'Brien - the Manchester Martyrs, were executed. Many of those involved in that escape later made their way to the USA and were present here in Calvary Cemetery when John Neary was finally laid to rest forty years later. 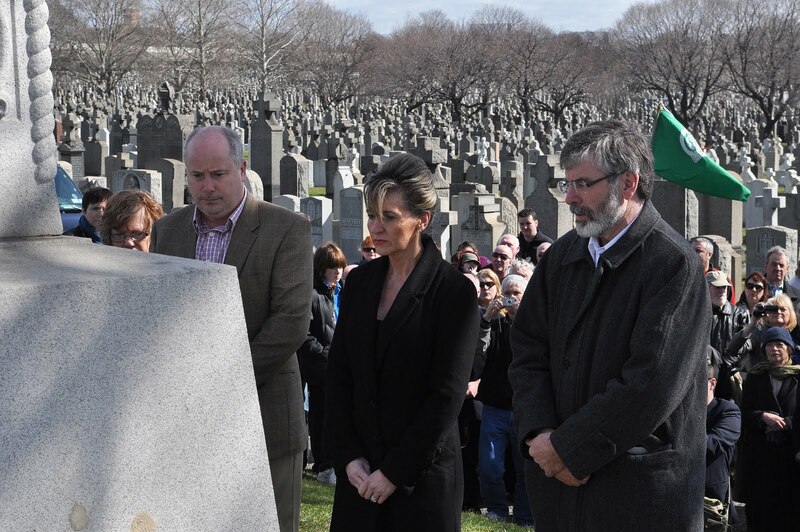 The Patriots Plot, and those who lie there, are a reminder of the long continuum of struggle for freedom in Ireland. They also symbolise the hugely significant role that the Irish in America has played down through the centuries in assisting that struggle. ‘having resolutely waited for the right moment to reveal itself, she now seizes that moment, and, supported by her exiled children in America ..’. Others, like Joe McGarrity and Clann na Gael played a crucial role in funding the Rising and then providing arms and political support during the Tan War. After partition and the counter revolution and the disastrous civil war many republicans were forced to leave Ireland and they went to the USA. But they never forgot their homeland. In 1969 when the most recent phase of conflict erupted Irish America stepped forward and again provided invaluable support for the oppressed people in the north and for the struggle. The Clann and Noraid and a host of other organisations came forward to help prisoners and their families, bring children to the USA for holidays away from the conflict, and lobbied US leaders to oppose British policy in Ireland. A very effective information campaign, often spontaneous, ensured that British propaganda was challenged. And there were some also who, as in previous generations, gave direct support and assistance to those engaged in armed actions – the IRA. One consequence of the conflict was the attempt in the 1970’s by the British to criminalise the prisoners and through them the struggle for freedom. In 1980 the men in the H Blocks and women in Armagh embarked on the first hunger strike. On March 1st 1981 the second hunger strike commenced. Bobby Sands was the first hunger striker. 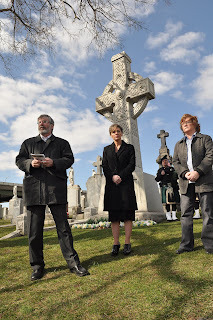 On Saturday morning as this blog reminded a large crowd of Irish Americans that on that day 30 years previously Bobby was on the 19th day of his hunger strike. Two days earlier on St. Patrick’s Day 1981 Bobby concluded the secret prison diary that he had been keeping. His last words in that diary on March 17th are a reminder of the spirit and resolve of the Irish people over many centuries to achieve freedom: “If they aren’t able to destroy the desire for freedom, they won’t break you. They won’t break me because the desire for freedom, and the freedom of the Irish people, is in my heart. The day will dawn when all the people of Ireland will have the desire for freedom to show. Bobby died on hunger strike along with his nine comrades: Francie; Raymond; Patsy; Joe; Martin; Kevin; Kieran: Tom and Mickey. Their courage and self sacrifice caught the imagination of Irish American activists who rallied in their tens of thousands in support of the prisoners. The extraordinary courage of the prisoners gave strength to the struggle. The hunger strike was a watershed moment in Irish history. And Irish America played a key role in that and subsequently in the efforts to build the peace process. So, those buried in the Patriots Plot in Calvary Cemetery, 3,000 miles from home, played their part. It is right that as republicans in Ireland remember the hunger strikers and all those to gave their lives in pursuit of freedom that we also remember those who went before them and who died in the far flung corners of the world. ...the rising of the moon. The great hunger and the great hunger strike. So right a commemoration in memory Gerry, more so than ever. Roger Casement was perhap in the minds as well in the words "...supported by her exiled children in America" The Patriots Plot is dedicated to the memory of souls . "The patriot's blood is the seed of Freedom's tree. "- Thomas Campbell, so well said. This was a great trip you Gerry ,I feel.